We have a number of walking holidays in France and the UK, which include 3 or 4 day's walking so that they can be squeezed into a long weekend or added onto the start or end of another holiday elsewhere. They are mainly independent walking holidays. So if you only have a few days available or just simply wish to walk for a few days, then our selection of wonderful short break walking holidays below is just for you. Our short break walking tours are designed to capture the essence of a place over a short period, whilst allowing you to enjoy great hospitality in authentic guest houses. High Point Holidays have a number of short break walking holidays in France to suit different tastes and walking grades, in locations as varied as the French Alps, the Auvergne, the Beaujolais and Burgundy. Our wine trail walking holidays are popular short breaks. We also have a number of short break self-guided walking holidays in England and Scotland. Some of these walking tours are purely shortened versions of full week holidays, whilst others are only available in a short break format. If you like the look of a week-long walking holiday but only have a reduced time available, then just let us know as it is often possible to tailor the length of the walking tour to suit your requirements. Varied independent walking through secluded valleys and beautiful countryside in the famous French wine growing region (vintage Beaujolais crus). This short break walking holiday in northern Beaujolais will suit those who enjoy wine tasting visits, great local cuisine and relatively easy walking. This independent walking holiday involves fairly gentle walking through vines and a collection of unspoilt historic villages built from a warm golden limestone set in panoramic rolling countrside. 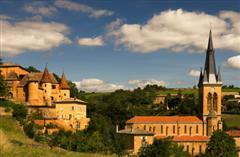 Historic chateaux, churches and country houses pepper the Beaujolais landscape on this short break walking holiday. Gastronomic region and B&B's full of charm and character. Longer version of this walking tour available. The Mont Lyonnais are a series of beautiful rolling hills rising to the west of Lyon, France’s second city. Less well-known than the neighbouring Beaujolais hills, this hidden country is a picturesque rural scene with a patchwork of lush grazing land, cherry orchards and forested tops. Choose between a self-guided 6-day traverse or a 4-day circular walking trail to discover these inviting, off the beaten track hills. A short break walking tour starting in the town of Tournus famous for its Romanesque Abbey. Your route follows in the footsteps of monks of medieval times crossing valleys and hills with meadows and Chardonnay vines, between charming historic villages and hamlets such as Ozenay, Uchizy, Blanot and the fortified settlement of Brancion. Wonderful early medieval churches adorn the villages. Your walking holiday finishes in the historic town of Cluny, whose abbey was once one of the most important pilgrimage sites in all of Europe. This self guided short break walking holiday explores the stunning Puy de Sancy mountains in northern Auvergne, including its summit, which at 1885m is the highest in France outside the Alps & Pyrenees. Your French walking holiday takes the form of a circular tour, starting and finishing in the pretty spa town of Mont Dore, taking in the most spectacular trails with expansive breath-taking views. The walking tour also explores many of the features that make up this beautiful Auvergne landscape including beautiful volcanic and glacial lakes, mighty volcanic domes, dramatic rocky cliffs, secluded glacial valleys and amazing waterfalls. Optional extra walking day. INDEPENDENT WALKING HOLIDAY - 4 or 5 nights - From £610/€670 - 3 or 4 days independent walking based in a guest house in Cassis. This self guided French walking holiday explores the Calanques National Park where gleaming white limestone cliffs form a stark contrast with the deep blue sky and the turquoise Mediterranean Sea. The Calanques coastline offers a unique landscape of beautiful fjords and dramatic cliffs, small ports and wonderful panoramic viewpoints. You'll stay in a delightful guest house in the pretty coastal resort of Cassis. This is a wonderful and unique short break walking tour from the historic cathedral city of Salisbury through quint-essential English countryside of meadows and chalk downs to reach the Saxon hill top town of Shaftesbury. You'll pass through quaint villages in southern England and ancient sites steeped in history and legend, including tales of Alfred the Great and King Canute. This independent walking tour can be extended to include 5 or 6 walking days. This self guided flexible walking holiday ventures across the very centre of the Cranborne Chase chalk plateau that was once a royal hunting ground. You can stay centrally or traverse this landscape with its unique character, in part, preserved by the strict laws that once governed the hunting of deer. The beautiful countryside of the Cranborne Chase is explored along the area of the Wiltshire / Dorset border. This short break independent walking holiday follows a stunning section of the South West Coastal Trail between Lyme Regis and Lulworth in Dorset, with a possible extension to Corfe Castle. This spectacular walking trail on the south coast of England is one of the most interesting and varied in the UK and has been designated a natural World Heritage Site by UNESCO. This short break walking holiday follows a dramatic and beautiful section of the South West Coastal Trail between Bude and Pastow in Cornwall, with a possible extension. The walking is varied and challenging with towering cliffs, prominent headlands and secluded bays and inlets harbouring well preserved small fishing ports and villages such as Port Isaac, Tintagel and Boscastle. A short break walking holiday traversing the Trossachs National Park in Scotland, a land of beautiful lochs and glens, forests and tumbling rivers. Opportunity to extend the walking tour to include a choice of walks on nearby islands including Kerrera with its ruined chateau and wildlife, and Mull with its famous capital Tobermory.